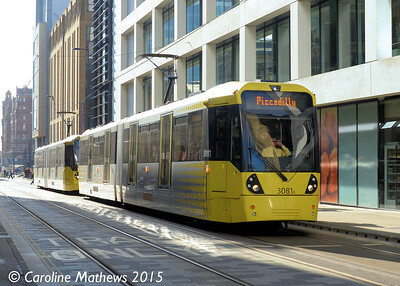 Trams in Manchester in 2015. 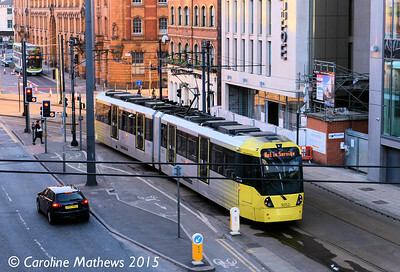 Not as many as there should be as two of my four planned trips to Manchester were cancelled. 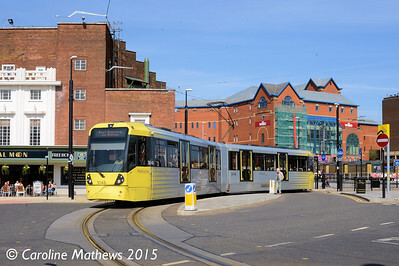 7th March 2015 was bright and sunny, leading to shadow problems along Mosley Street. 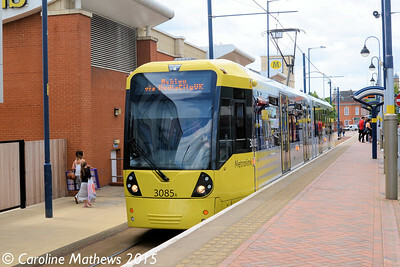 I took photos nevertheless, such as this one of 3093 at the front of a pair heading out of town. 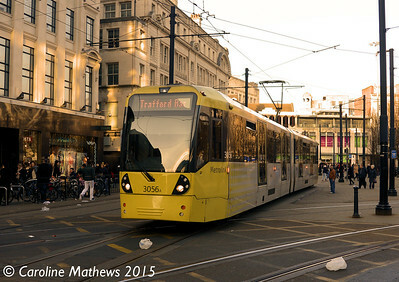 Crossing the triangular junction and heading into Mosley Street on 7th March was Trafford Bar bound 3056. 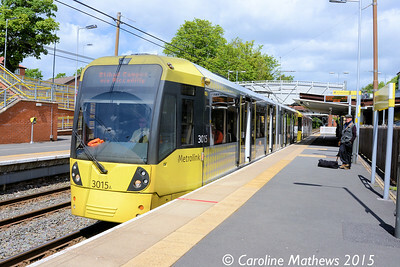 At the same location was 3079, heading for East Didsbury. 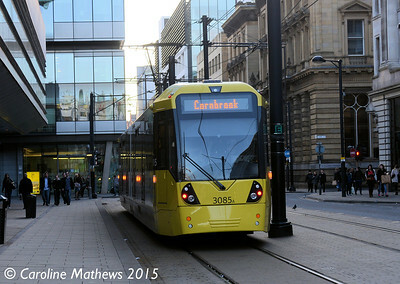 Also heading down Mosley Street was 3085, heading for Cornbrook only. 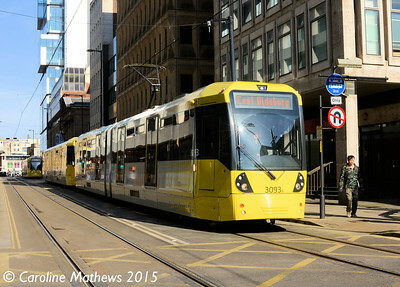 20th April was a day for travelling rather than photography as I took my partner around as much of the network as we could do in the few hours available. Nevertheless a couple of shots were taken. 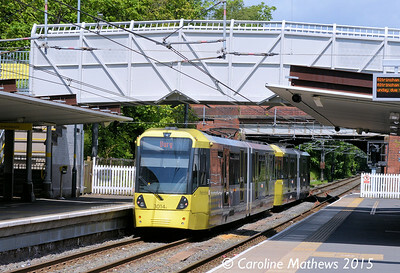 First one was of 3048 near the Rochdale Town Centre stop. 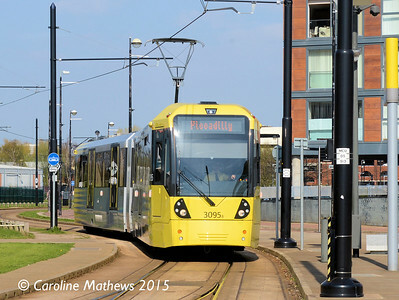 The only other shot from 20th April worthy of inclusion here was of 3095 seen approaching Media City UK. 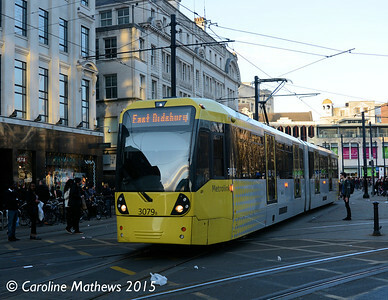 First trip on 5th June was to Bury for hat buying in the market. 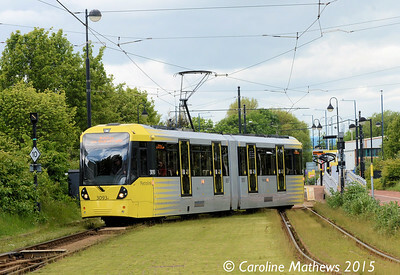 The trams were heaving due to some music festival in Heaton Park, and our tram back to Manchester was taen out of service at Crumpsall due to damage caused by festival goers. 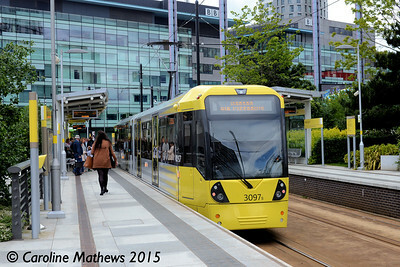 Next tram in, which took us to the city, was 3015, which was photographed rather than being ridden. 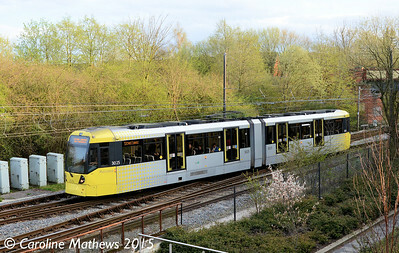 3014 is seen at the rear of a pair leaving Crumpsall for Bury on 5th June 2015. 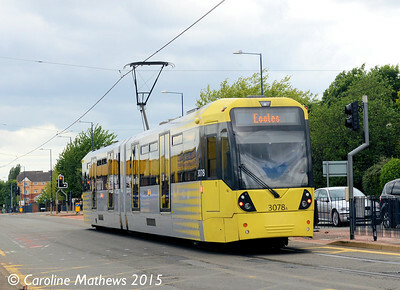 Another view of 3073, this time at the Eccles terminus. 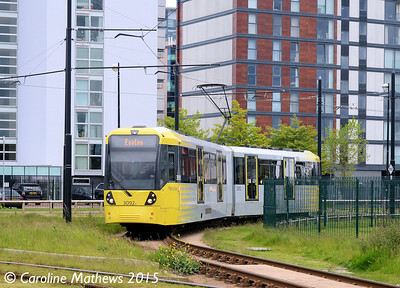 Also seen at Eccles was 3085. 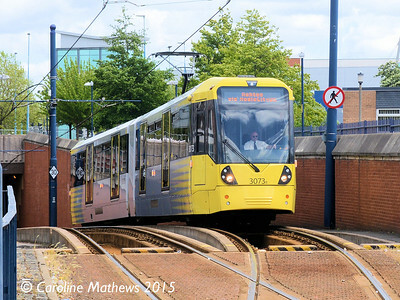 Metrolink 3070 took me from Eccles to Weaste where I alighted to photograph the old tracks still visible in Hessel Street. 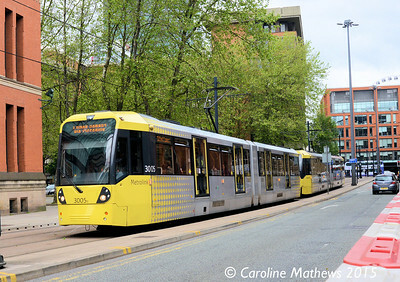 3070 is seen heading off towards the city centre. 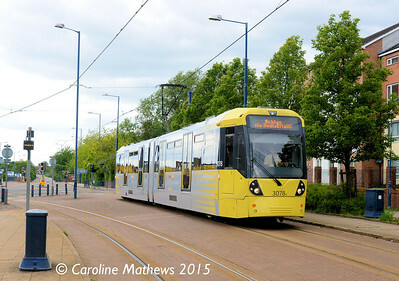 Metrolink 3078 seen heading towards Eccles along Eccles New Road near the Weaste stop on 5th June 2015. 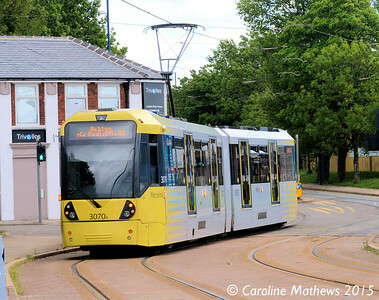 On 5th June trams to and from Eccles were running via Media City UK which meant the third side of the triangular junction was in use. 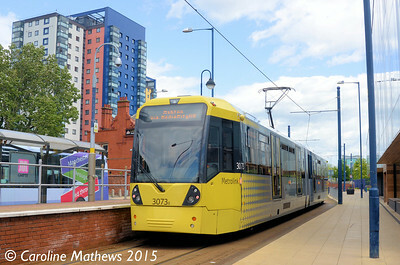 I got off at Broadway in order to photograph 3078 crossing over oin order to gain the line to Media City. 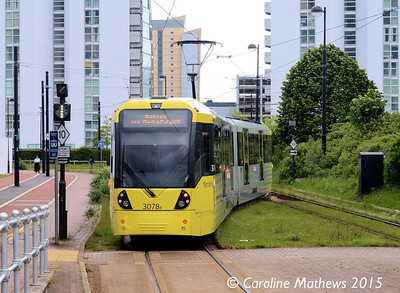 3098 is seen on the single track connection from Harbour CIty and Media City UK on 5th June. 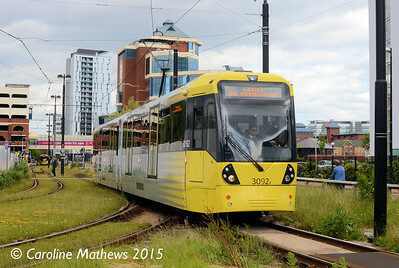 3092 again, this time coming on the single track connection from Media City UK to Broadway as it continues on its journey to Eccles. Last shot of the day (and the year!) 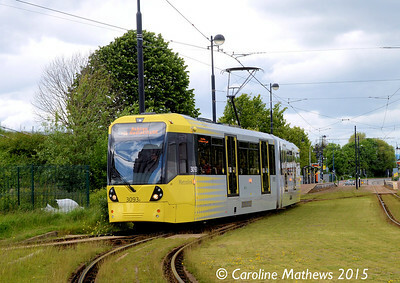 was of 3005 and 3016 on AytounStreet. The September trip was relinquished due to rail engineering works and the December trip was cancelled due to the catastrophic flooding in my home town.